Getting right to the heart of the matter, we talked about the Tesla Semi announcement and what it meant for reducing or eliminating emissions from heavy-duty trucks. Ian shared that, while Tesla was able to put on a good show, electrifying heavy-duty powertrains was nothing new. “I’m very pleased to see other companies getting around to addressing trucks,” he shared. “As Tesla did with cars, [the Tesla Semi announcement] will raise awareness across the industry.” Ian commented that using fully electric trucks for long hauls did not make sense to him, as the sheer number of batteries required for a long-distance haul would make the vehicles extremely capital intensive, in addition to the weight of the batteries having a detrimental impact on hauling capacity. Ian and company took a different tack with Wrightspeed, which focuses on striking a balance between reducing fuel consumption and emissions as much as possible by looking at the least efficient applications of internal combustion engine vehicles. They found the sweet spot — or the sooty spot, if you will — to be refuse trucks and local delivery vehicles like those used by FedEx and UPS. To realize this opportunity, the Wrightspeed team built a suite of powerful yet efficient plug-in hybrid powertrains for heavy-duty, frequent, stop-drive cycle trucks that allow owners to slash fuel consumption and emissions more than 50% compared to conventional petrol powertrains. 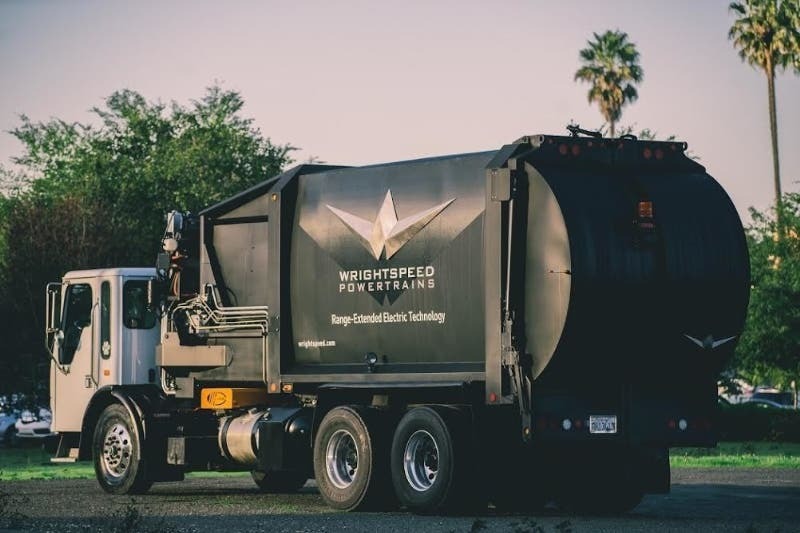 Wrightspeed does this by utilizing electric motors alone to drive the wheels and move the vehicle forward, which is complemented by a microturbine that runs on any number of fuels — including liquid propane, diesel, liquid natural gas, compressed natural gas, or even landfill recovered gas (sour gas). The microturbine exists solely to provide electricity to the battery packs. One of the many innovations in Wrightspeed’s solution is its Fulcrum microturbine, which was developed in-house. Ian shared that it delivers efficiencies that are very close to the same as the best of the gasoline piston range extenders used in the Chevy Volt and the BMW i3. With comparable efficiency, where the turbine really shines is in maintenance. With only one moving part, two bearings, and no piston rings, maintenance is as easy as changing the air filter and fuel filter, which are extremely simple compared to the maintenance required on a heavy-duty diesel refuse truck or delivery truck. With such a prominent name in electrified vehicles entering into the competitive landscape, my question was “does the Tesla Semi Truck announcement change anything for Wrightspeed?” Ian shared that he believed Tesla moving into electrified trucks would help the mainstream media and mainstream consumers to be more aware of the problem and the varied solutions available to solve the problem and that, if anything, it should help the industry. Just as in the early days of internal combustion vehicles, today’s electric vehicles feature numerous innovative technologies, with batteries representing one of the most varied of the bunch. I asked who supplied Wrightspeed’s batteries and Ian shared that they used Toshiba’s lithium-titanate (LTO) batteries. He shared that back in 2003, when he was with Tesla, their battery technology improvement projections led them to expect batteries to improve much faster than they have. There have been cost-competitive technologies in batteries like lithium-iron-phosphate (LiFePo) that have promise and are being adopted for commercial applications today. BYD and SimpliPhi Power are two big names using LiFePo chemistries, for example. There are also a number of emerging chemistries, like lithium-titanate, where Ian expects costs to continue to come down over the coming years as volume ramps up. Lithium-titanate batteries are already being used in a handful of electric vehicle applications, like Honda’s Fit EV and some of the Japanese versions of Mitsubishi’s MiEV, but the tech has yet to see true mass-production volumes. Ian believes it is superior to more conventional lithium-ion chemistries because it is not prone to thermal runaway, and he noted that it is the hardest battery chemistry to have any bad things happen, making it very safe. That’s exactly what you want when you are lugging around a few hundred kilograms of batteries in an electric car or truck, if you ask me. In addition, LTO batteries can be charged down to -30°C whereas many of the other high-energy battery chemistries cannot be charged below freezing. This means the batteries do not require a heating circuit to keep them from freezing, nor do they have to expend the energy to keep the liquids in the battery from freezing. Finally, the constituents of LTO batteries are not sourced from conflict areas, like the hotly debated cobalt in Tesla’s batteries. Cobalt is not a show-stopper at current volumes, but with the majority (63%) sourced from politically unstable Democratic Republic of the Congo, it will have to be managed very closely if automakers using it are going to sustain the insane growth curves EVs and stationary storage are going to experience over the coming years. LTO batteries are also easier to recycle than chemistries containing cobalt. Ian shared that he is passionate about completely displacing heavy-duty vehicles in open environments and believes the financials make it a no-brainer for many companies around the world today. Converting the heavy-duty vehicles roaming around neighborhoods to pick up trash day in and day out to plug-in hybrid electric and fully electric powertrains will also have a noticeable impact on noise pollution. That’s another one of the many, many benefits of electrified transportation that we just don’t talk enough about. Feedback so far is extremely positive for Wrightspeed, with most people left in awe of how quiet they make refuse trucks. Regenerative braking also has an extremely positive upside in that conventional refuse trucks chew up a set of brake pads in 3 months. That’s a lot of nasty particulate that we have been breathing in that simply goes away with plug-in vehicles. Wrightspeed is currently focused on the US and North American markets but has had significant interest from folks in New Zealand where they are paying $8/gallon for petrol.